These are paraphrased words and therefore not the exact words of Shaykh Ahmad Dabbagh – For the full details please listen to the corresponding lecture. Only benefit ourselves by taking the message of his life. When the devil was a pious creation of Allah by the name of Azazil, Allah elevated his station by taking him to paradise. This same creation when he had attained and managed to bring certain evil traits in him he was rejected! Likewise imam Hussain (ra) went against Yazeed because he also saw those evil traits in him. If we also have these same evil Traits in us then we will be in the camp of Yazeed on the day of judgement and not in imam hussains. 2) He (ra) gave a speech to the people on that day as a result of which many of the people changed their attitudes. Switched their sides and joined imam hussains side. One of the prominent person was hoor bin Yazeed. Allah has relationships with his creation on the bases of taqwa and sins. If you have taqwa then you will be the friend of Allah, whereas if you are dominant with sins then you are the enemy of Allah and he is with you. The war of imam hussain’s (if that can be classed as a war, on one side only 50 or 60 people and on the other 200 – 300 people). was a of principles and values. Simply listening to speeches will not change the condition of a person. Without the attempt of the individual to change first. As shaitan listened to the speech of Allah but despite this it has not saved him. – Sins are the heirs (gifts) from the cursed one. Whereas the good deeds are the gifts from the prophet (saw). – the dawah of the message of dheen is so important that imam Hussain (ra) sacrificed himself for it. So important that the prophet (saw) was stoned because of this message. They have fulfilled their duties what are we doing now? Where is this message now? – the duties one has to perform for this world like maintaining his family, work etc should be like entering into the toilet inorder to fulfill a need. Once that need has been done then we should leave the toilet and continue. Now a person does not remain in the toilet all the time saying “I have a need”. He does his needs, fulfills his desire and then leaves to do the other greater deeds. – Whoever has made this world his objectives the prophet (saw) said – to the nearest wording: Allah will make his affairs difficult. However someone who has made the hereafter his objectives Allah will help him with his affairs. …Let hoor bin Yazeed be the example for you of what happened to him on that day. Incidents of kabalah. What will these tears do if they don’t change into action. The ultimate lesson you should take from my life is the sacrifice. I have shown you an extreme example of sacrifice. 0 people now is the time for you to do the sacrifice. Fight your own karbala. You find what is your Karbala, drugs? women? name and fame? Some of you are in the battle field without the armory, (the knowledge of the dos and don’t). You are just waiting to be killed. Some of you have the weapons and armory but are not putting on themselves for the battle. Whilst there are those who have everything (armory and the weapons), they are fighting bravely and courageously. They are the recipients of our fez and upon them we are pleased. The example of the armory is the sunnah of the prophet (saw). The example of the weaponry is the path of the prophet (saw). Fight your desires, fight your laziness. All success lyes with following the master of creation. You will find in my life and the companions this – an example of how to follow the blessed sunnah”. 4) Although Allah gave us the organs of the body as a test. He also gave them guards to help us in stopping from committing sins. E.g the eyes have eye lids, with which we can close upon seeing something unlawful. Similar is the case with other organs of the body. (tongue, hands, feet etc). 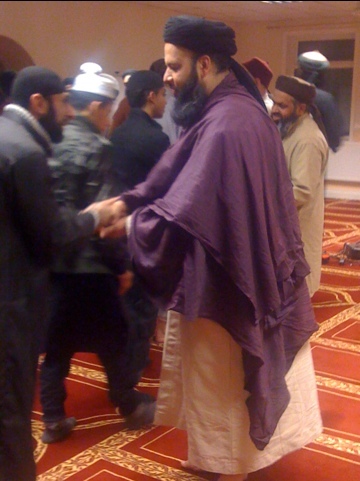 After the concluding dua Shaykh Ahmad Dabbagh meeting the attendees.